A Great Big Pile of Leaves is an Indie Rock band from Brooklyn, New York. The band is composed of guitarist/ lead singer Peter Weiland, bassist Tucker Yaro, guitarist Matthew Fazzi & drummer Tyler Soucy. Together, the band creates a sound that brings together sounds of bands like Taking Back Sunday, Motion City Soundtrack, Saves The Day, The Appleseed Cast and Hellogoodbye. A Great Big Pile of Leaves also incorporates some earlier rock sounds into their style to help bridge the gap between the modern-day rock sound and the sound of the rock music from a little earlier on. The combination of Indie Rock and Alternative create a sound that will grab the attention of many music lovers. There are very few albums that grab your attention so hard and so completely that you just let the album play out because you are really enjoying the music, but You’re Always on My Mind from A Great Big Pile of Leaves is one such release. From the first note, you know you’re listening to something that really has that type of energy to it. 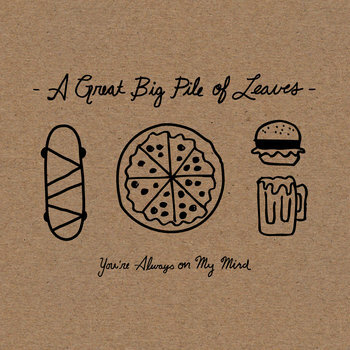 You’re Always on My Mind from A Great Big Pile of Leaves begins with the track “Snack Attack”. The track begins with a’capella vocals that lead into Indie Rock. The Indie Rock on the track has a certain amount of beauty that goes along with the repeating vocal from the beginning of the track. The harmonizing vocals from the band members help to add to the music that seems to keep building throughout the track until it comes to an end. The track “Flying Fish” is a lot more cohesive than the first track as it has a definite shape to the music that makes up the track. The song features lyrics that will have the listener singing along and the melody line in the lyrics helps to add a lot of substance to the music of the track. Together, the music of the track, the melody line in the lyrics and the lyrics themselves all come together to create a track that is a lot more commercial than the first track. And while the first track of “Snack Attack” is still a strong song, “Flying Fish” is a lot more infectious, musically speaking. It is with the song “Pet Mouse” that the album of You’re Always on My Mind from A Great Big Pile of Leaves really picks up energy. The song has the same type of infectious feeling as “Flying Fish” except that “Pet Mouse” feels a lot more like a single. The track has a very catchy introduction that leads into a great refrain that is very strong. The resulting track has a great musical quality to it and the slightly humorous lyrics that are found on the track will also capture the listener and have them hitting “repeat” over and over again. In fact, you could really imagine “Pet Mouse” as being one of the strongest tracks off the release. While “Pet Mouse” by A Great Big Pile of Leaves is definitely the strongest track on their newest release, it is how the rest of the album shapes itself around the track. Like “Pet Mouse” before it, the song “Slumber Party” finds the band creating yet another track that also has a fair amount of humor in its lyrics. The humor once again grabs hold of the listener and the Indie Rock/Alternative Rock music of the song makes the track very catchy…just like the track before. While A Great Big Pile of Leaves seems to stay within a certain Alternative Rock/Indie Rock style to their music, that doesn’t mean that they only use those two styles of music to help shape the sound of their music. With the track “Back to School,” the band seems to incorporate a little bit of jazz guitar into the groove on the track. The smoother feel of the music on this song lends itself well to the various tempos found on the track. The way the band segues smoothly from one tempo to another makes the song very fun and the band brings back a bit of the harmonizing that was found on the track “Snack Attack”. The slower tempo on “Ambiversion” finds the band revisiting a sound that could easily have come from the mid-seventies. The resulting sound of the music and the style in the vocals on the track could easily remind you of something from The Association. The big difference in the music of The Association and the music of A Great Big Pile of Leaves is that the guitar work on the track is a lot heavier than anything that The Association would have had on any of their music. The You’re Always on My Mind album from A Great Big Pile of Leaves has a definite sound and style to it. The tracks all work together to feel as if they are part of one release. That may sound weird, but very few albums today have that musical “glue” that hold them together. This album is strong and enjoyable from the first track to the last with no real weak tracks to distract the listener from the real beauty of the release. For the band’s video to the song “Pet Mouse,” click the link. Visit the band’s label of Topshelf Records.